We left our typical barstool beat to explore the rum-soaked culinary culture, with tips on where to find the best Cuban food in Boston. “Put rum on it,” our tour guide Manny advised as we headed from the Havana airport to the Miramar district. At the invitation of Berklee College Professor William Banfield, we had abandoned our local belly-up regimen for a week in Cuba, where a dose of “vitamin R” in all iced drinks was the recommended way to savor a signature product and combat potential digestive hazards. 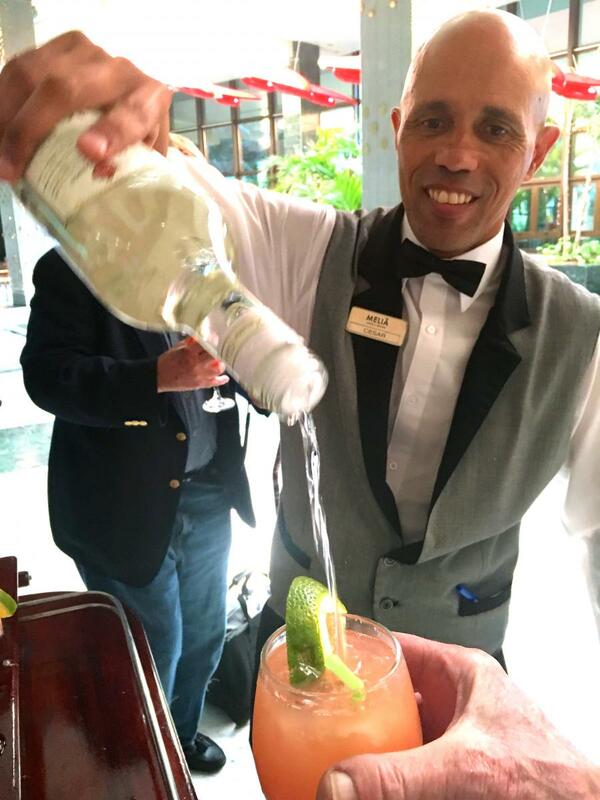 At our hotel, we were greeted with a typical Cuban welcome — individual glasses of mixings (daiquiri in this case), topped at one’s pleasure from a shared bottle of Havana Club. Readers, we’re not in Boston anymore. *A note on how we got here in the first place: We visited as part of a People-to-People Exchange, one of twelve categories under which US citizens may currently travel to Cuba. Though you still can't plan a solo beach vacation, it's getting much easier to visit the country if you connect with the right guide. For more information, we recommend contacting Silvia Wilheim, our Miami-based tour organizer supreme. Manny also frequently stressed that life in Cuba is complex and not fully accessible to visitors on cultural exchanges. The dance clubs that accept foreigners’ convertible pesos (CUCS) after 10 PM are lively to be sure, but Cuban nationals, prohibited from holding CUCS, hear the same bands at the 5-9 matinee for a smaller number of Cuban pesos. Similarly, one needs CUCS to dine in paladars, the government-licensed restaurants in private homes that attract visitors. Many paladars have international reputations, yet the limited availability of many ingredients and high prices reinforce the notion that in Cuba, culinary revelations are in short supply. And while we did tire of lechon asado (citrus-marinated roast pork) and ropa vieja (in direct translation, "old clothes," a shredded beef dish braised in a sofrito of onions, bell peppers, garlic, tomatoes and spices), we grew to love congris (the rice and black bean staple of all Cuban meals—the soupier the beans, the better), and welcomed every flan that arrived at meal’s end. 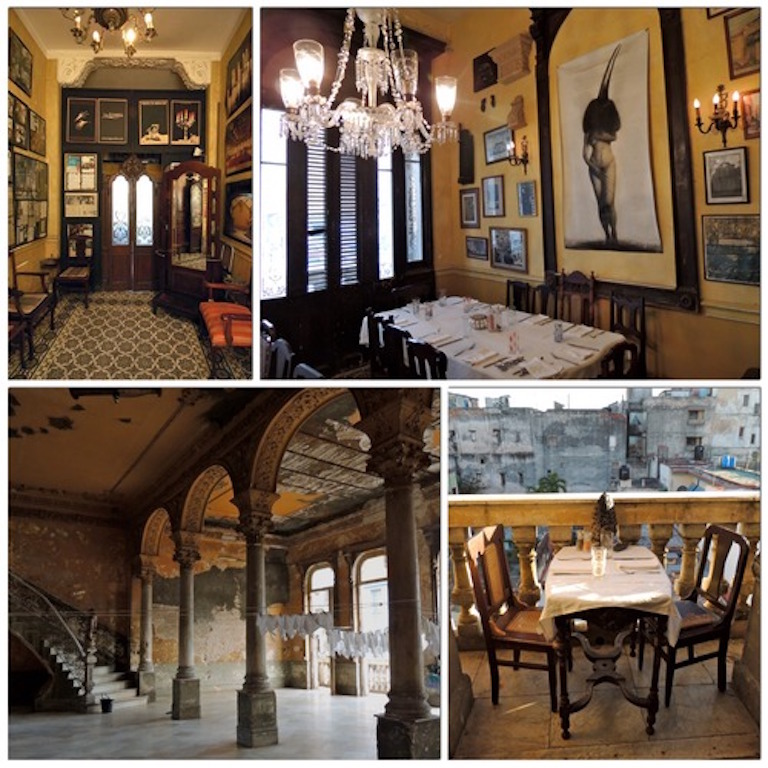 Cenar en Cuba: Still, dining was a celebration, reflecting the vibrancy of Cuban culture in the décor and music, and chef's and family's pride in the transformation of often humble settings. Thanks to Silvia, we visited many of the most heralded paladars, including El Cocinero, Dona Eutimia and Atalier. Three meals stand out. Everyone visits Ernest Hemingway’s house on Havana’s outskirts, and we had our best traditional meal in the nearby village of Cojimar, featured in The Old Man and the Sea. At Café Ajiaco, the garlic roasted chicken, catch of the day and savory ropa vieja were Cuban cooking at their best, not to mention the beans and rice; in each dish the cumin, garlic and local peppers were distinctive, yet never over-aggressive. But the true standout was the soup of root vegetables (including chunks of corn on the cob), bits of meat and the almost-sharp ajaico, the native pepper that can be traced to the Taino Indians and lends its name to both the dish and the restaurant. It just might be a cousin of oxtail soup. 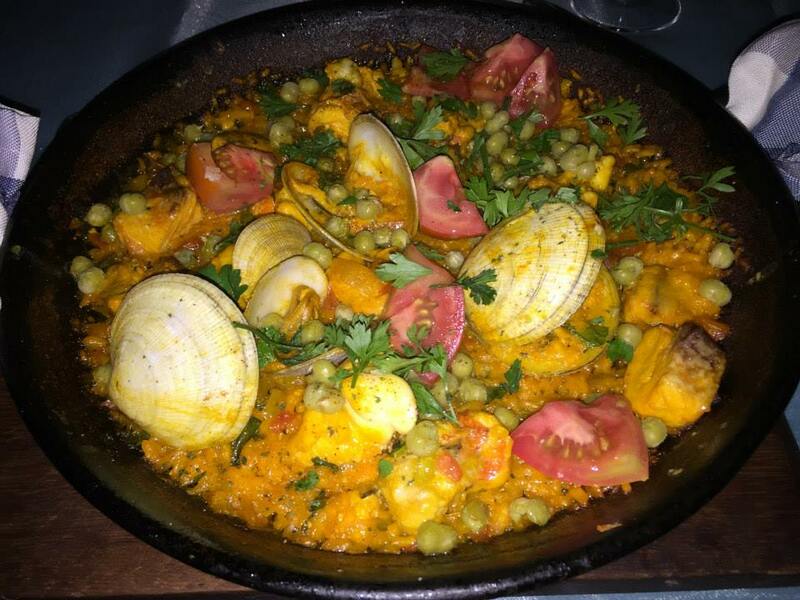 For something different, Ivan Chefs Justo, tucked into a corner of Old Havana, served what is considered Cuba’s best paella—perfectly-cooked, saffron-seasoned yellow rice, with ample portions of clams, shrimp and langostino, dotted with peas and parsley. The eclectically decorated paladar, where historic photos share wall space with images of Marilyn Monroe, also featured an appetizer course of empanadas, tachinos (fried plantain) and yucca croquettes, plus the ever-welcome mojito we received as a greeting. Bebir en Cuba: Our instinct that La Guarida was a place to ignore Manny’s rule and order dry martinis proved correct. Elsewhere, rum ruled. Among the flow of mojitos, Cuba Libres and piña coladas, the daiquiris at the Havana end of the Mirador de Bacunayagua (the highest bridge in Cuba) turned a bus stop into a rollicking fun fest. 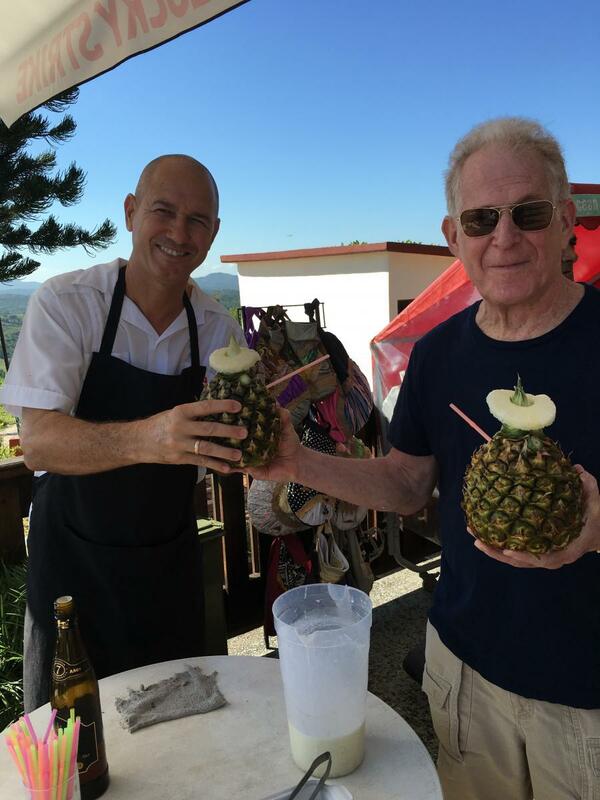 A smoothie in a carved pineapple, topped with as much rum as one wants, was a refreshing break on the ride to the Northern province Matanzas, where the spirited musicians at El Chiquirrin elevated the restaurant’s standard fare. Digestif: Contrary to numerous warnings, we rarely encountered smokers where we dined. Yet the lure of a Cuban cigar, and the urge to belly up, led us to the outdoor pool bar at our hotel, the Meliã Habana. When our bartender Tomas learned we were from Boston, he proudly identified himself as a former Yankee fan who changed allegiance when his son became a member of the Little League Red Sox. “Too bad we can’t take your photo holding your son’s uniform,” we said, to which Tomas responded by retreating to the back room and returning with his associate Marlon, who was sporting a Red Sox hat. Both bartenders send regards to right fielder Rusney Castillo, who they affectionately refer to as Papito. While hopping a plane to Cuba isn't always an options, we've dug up some authentic eateries to help you recreate the experience here at home. Centre St. in Jamaica Plain is Boston’s hub of Cuban cuisine, with El Oriental De Cuba, Old Havana and Miami Restaurant among the popular spots. The ubiquitous Cuban sandwich can be found all over town, but for our money, none beat the Cubano at the Montrose Spa in Cambridge. And for another personal preference, the shredded beef in the quesadilla at Quincy’s La Paloma (yes, it's technically a Mexican restauarant) equals any ropa vieja we sampled in Havana.